I've been following my local area on excel (I know, sad tw@t), but it's showing some very revealing trends. Of course these are just my local area, but there is a whole cross section in this part of hove from £3 million houses owned by rock stars like Dave Gilmour, to £150,000 one bedders above shops. Hove is also one of the most in demand areas due to it's so called commutability (it's a miserable journey). Anyway, I felt the market begin to turn back in August and decided to track the number of properties for sale in my price range (250-400), total number of properties and properties for rent to see if any trends would emerge that would determine future prices. 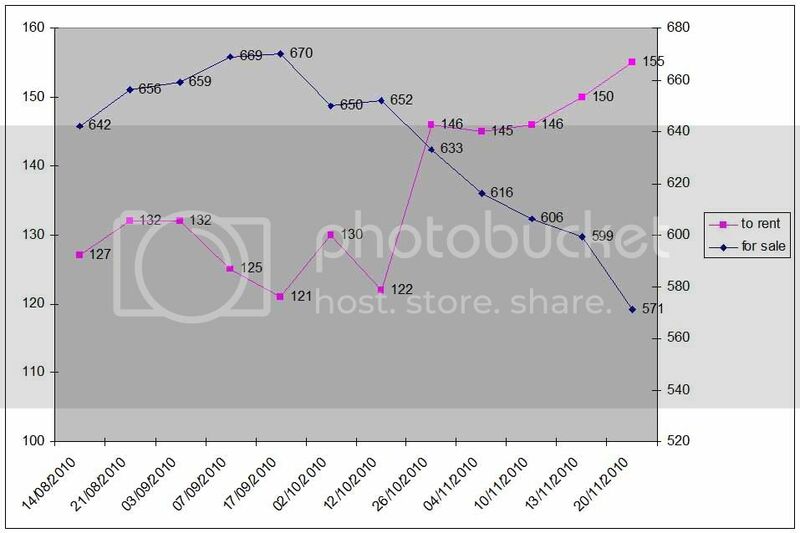 The number of properties in my price range has flatlined, but as the graph below shows, the total number of properties for sale has dropped significantly, but contrary to what knobheads from the BTL ramping brigade would have you believe, the number of properties for rent has risen, and is still rising significantly. 1.Since sales haven't risen dramatically, and may be falling (haven't seen data yet) it is obvious that those not serious about selling are withdrawing their properties from the market, and new sellers are holding off so not replenishing lost stock. I think this may be partly why we're seeing rightmove asking prices falling...people who are testing the water with unrealistic prices are leaving the market. However, I'm also seeing a lot of price reductions on properties, which suggest serious sellers are not getting viewings, let alone offers. 2.There is an increase in the number of reluctant landlords, something we saw back in 2008/09. There are more properties available for rent in my area than at any time since I moved down here. This will result in a reduction in rents due to oversupply, and will feed back into the price of properties as well. 3, The reason that my price range is flatlining is that sellers from higher up who are genuine sellers are reducing their prices as the non-serious sellers in my range exit the market. I suspect that the number of properties for sale will reach a nadir in the next few months as the non-serious vendors finish withdrawing from the market, and then the number for sale will start to rise as we see in an increase in the number of forced sellers, and the continuation of the FTB and investor drought. I expect the number of places to rent to increase further then plateau as the number of reluctant landlords evens out. I empathise with your spreadsheet fettish. I'm surprised to see the number of rental properties increasing, I have to admit I have started believing the EA stories of shortages. I wonder if this is unique to your area? People always take their homes off the Market in winter to "wait for things to pick up in the spring" there's no shortage yet. Rightmove say properties per agent are still at an all time high. Supply will fall over the winter but it will pick up again early next year. to £150,000 one bedders above shops. Sorry but that is a dreadful graph. Great for dramatic effect but using different scales on the y axis is very misleading. It looks like you have deliberately manipulated the scales to make them appear equal changes but in the last month for 9 new rentals there are 62 less sales. If there were 62 new rentals i'd go along with your theory, but 9 is not significant IMO, your graph even shows that much normal fluctuation in any 2 week period. No correction as yet no. You're obviously a complete moron when it comes to statistics. The percentage change is similar. I won't explain why that's relevant as it would be wasted on you. Well you're a bit hasty in resorting to personal insults. So why didn't you use "percentage change" on the Y axis? But still showing a similar percentage change would be even more misleading if the reader didn't know the relative sizes of the markets as for your theory to be correct the number of properties moving to rental would show as a much greater percentage in the much smaller rental market. The fact is all your graph shows is a fall in properties for sale and a normal fluctuation in the number of rentals. If anything it proves that there is no significant move to rental. People looking for houses to rent in many parts of the UK are encountering a new hurdle in their hunt for a home. Landlords, or more often their letting agents, are increasingly asking would-be tenants to compete by making "sealed bid" offers for the home they want. The practice is relatively commonplace in the market to buy homes, but is seen as a new development in the rental sector. The demand for rented property is rising during the mortgage drought. Many more families and individuals find they cannot afford or get mortgages, so they are having to compete against each other to secure a tenancy. No wonder rents are going up then if they are starting to do this.